Anafi island in Greece. Beaches. Ferries. Accommodation. Anafi is the southernmost island of the Cyclades and is located just east of Santorini. It is one of the Cyclades least populated islands. It has approximately 370 inhabitants and the island's surface is 32 km2. 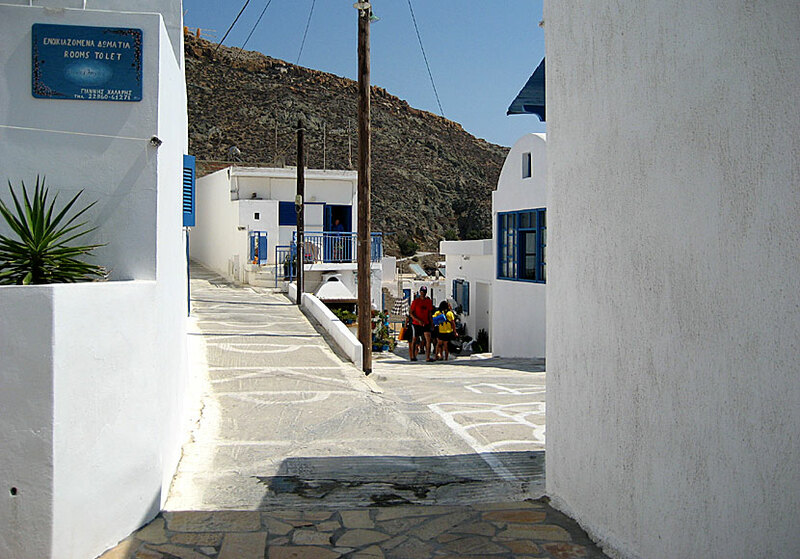 Almost every one lives in Chora, which is the only village on Anafi. Highest mountain is Vigla, measuring 582 meters above sea level. Anafi is one of the least visited islands in the Cyclades. It has nothing to do with the island; it's because of the bad boat connections. Despite the tricky boat connections, Anafi has some fans, some returns year after year and the last thing they want to see is more tourists. Those who like Anafi, do it partially because its seclusion. Many like to be at the end of the world. 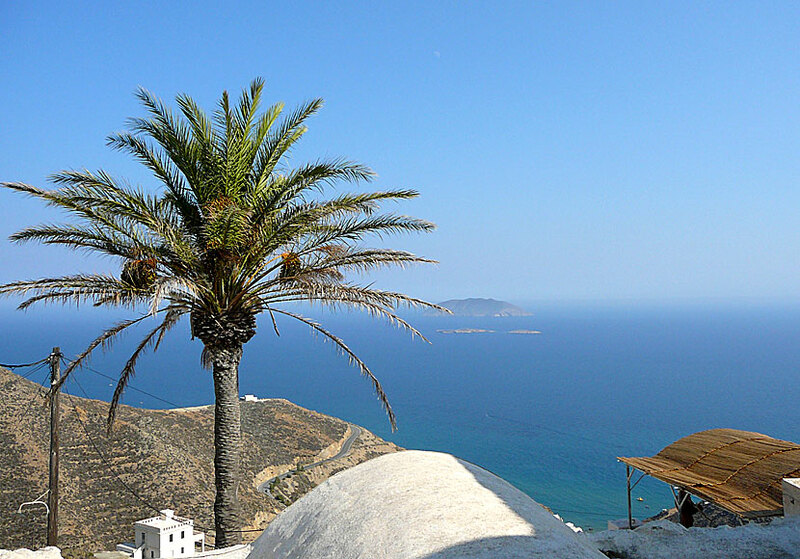 The view from Chora on Anafi is magnificent. Of course there are other things that attract visitors to go to Anafi: partly because of the peaceful atmosphere, partly because of the lovely village of Chora, partly because of the beautiful beaches. The island has about 240 inhabitants; some make their living from agriculture and fishing. But in recent years, many have changed profession and focused on tourism instead. This is particularly noticeable when you see all new pensions in Chora. Many years ago, I met a Danish couple who were sold on Anafi, which then was a totally unknown island for me. They talked enthusiastically about an island that had stopped in time. There were no roads, there was only one taverna, one cafe, one pension and one telephone. Tourists were an unknown phenomenon. Since I was a young man in those days, I thought it sounded as dull as dishwater. Now I regret that I did not visit Anafi at that time, it would have been exciting. I've been to Anafi twice. The first time I was in the room with a high fever during the entire stay. My wife Camilla made a short boat trip to the beaches, sadly without camera. We went unhappily to Santorini again without having seen, or experienced the island. The best option is to go by air to Santorini, and travel on by ferry to Anafi. Anafi has boat connections with several islands in the Cyclades. Expect long boat trips if you go from other islands than Santorini. You will find a link to a boat timetable at the bottom of the page. Anafi has also boat connections with Karpathos, Rhodes and Crete. The beach in in the Port. The bus runs between Chora and the port, and to the monastery Moni Kalamiotissa. On the way to the monastery the bus passes several beaches, including Klisidi beach. From the port there are bathing boats to all the beaches on the south coast. Scooters, motorcycle and car available for hire. The only village on Anafi is called Chora and is about 10 minutes by bus from Agios Nikolaos, which is the port of Anafi. In the port there are a few tavernas, one bar, one travel agency, one shop, a few pensions and one ATM. Behind the harbour is an electricity-producing diesel unit that hums. If the wind comes from "the wrong" direction, the sound of the power station can be disturbing. Almost all inhabitants lives in Chora about 260 meters above sea level. It is a super cute village with narrow alleys and whitewashed houses. Chora is so beautiful and charming that you might think that it's a movie backdrop. There are shops, pensions, cafes and several tavernas, most offering divine views of the sea. Several of nice beaches along the southeast coast. 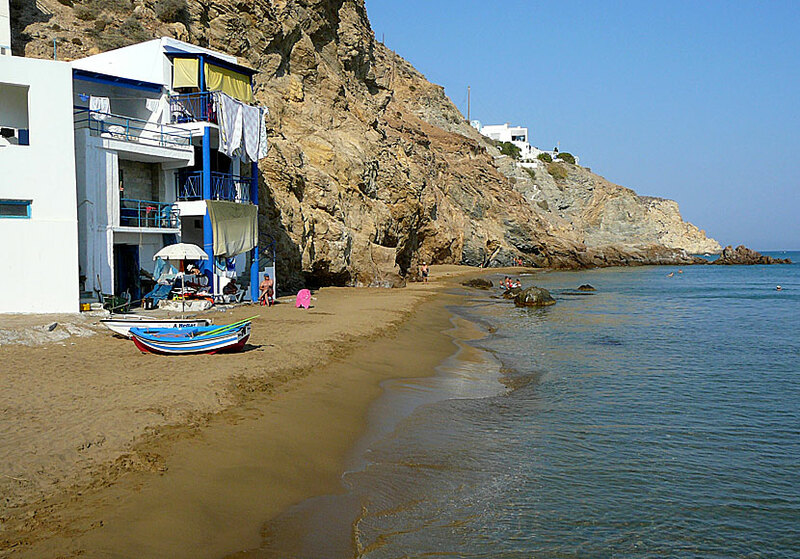 The most popular one is Klisidi beach (see photo at the end of the page) approximately ten minutes walk from the port. Here are a number of pensions and tavernas. After Klisidi beach ones can continue to Katsouni, Roukounas, Katalimatsa and Mega Potamos. All beaches are reached by bathing boats from the port. Nudism and wild camping is common. There is also a pretty nice beach in the port. 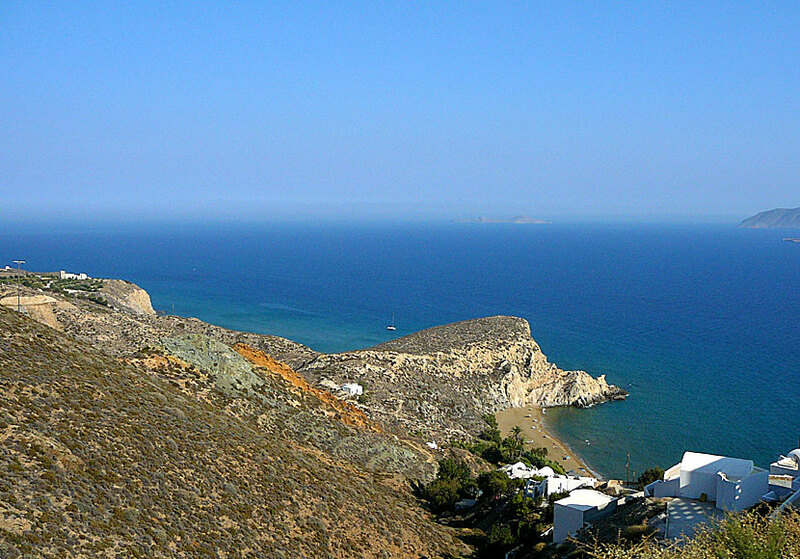 Klisidi beach seen from Chora. No particular sights apart from the beautiful Chora. Do you like to hike, you can walk to the monastery of Moni Kalamiotissa which is situated high on a cliff (470 m) on the eastside of Anafi. Go by bathing boat to Kalamos beach and then follow the path upwards the mountain to the monastery. You will be rewarded for your pain when you gaze over the sea. The view is simple delightful. If you do not want to, or can, go to the monastery, you can take the bus. 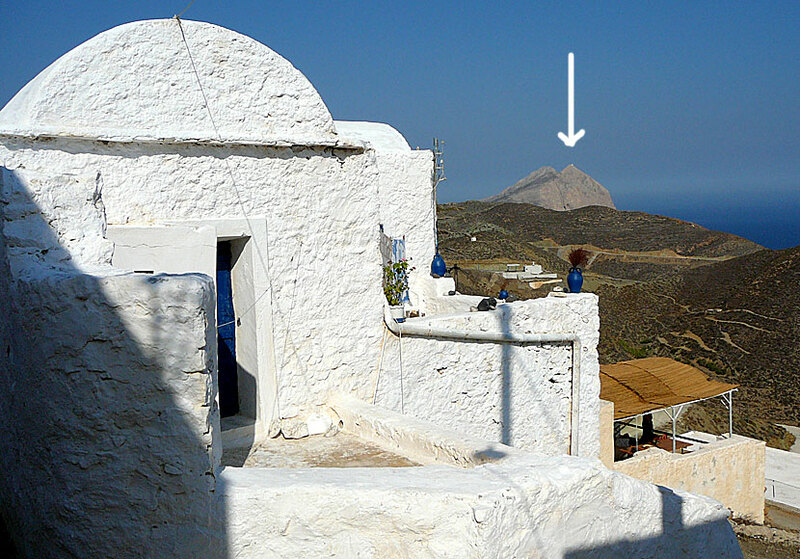 The monastery Moni Kalamiotissa is below the arrow. There are relatively plenty of rooms for such a small island. Many pensions are new and of high standard. 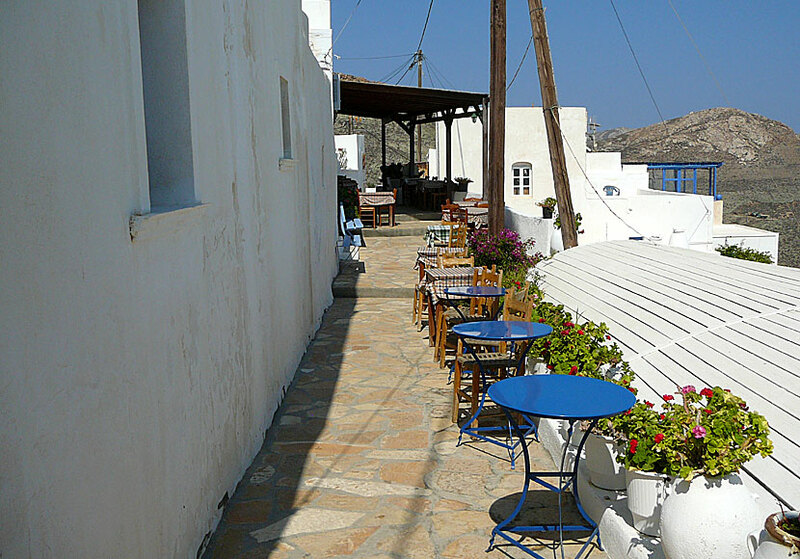 Rooms are available for rent in the port, in Chora and at Klisidi beach. Letter of rooms usually meet up in the port when the ferries put in, except in August when all rooms on the island are booked up. If you are going to Anafi in August you must book ahead, there is no point to take a chance, believe me, I've tried. Apollon Village Hotel is a very popular small hotel.